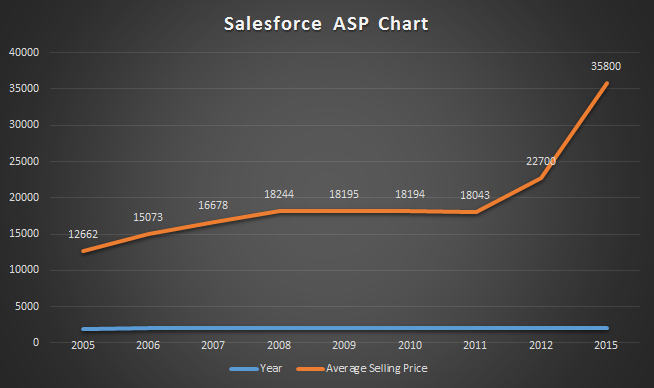 Salesforce pioneered the idea of delivering cloud-based SaaS to businesses for a monthly/annual subscription fee. They were wildly successful in disrupting the on-premise CRM software market. Salesforce allowed customers to get started within days … large multi year implementation projects with upfront licensing fees became a thing of past. The reason for their success: They offered a solution that was relatively simple (to implement & use), affordable and convenient. Infact in 2004, Salesforce claimed that they derived a significant portion of [their] revenue from small businesses. 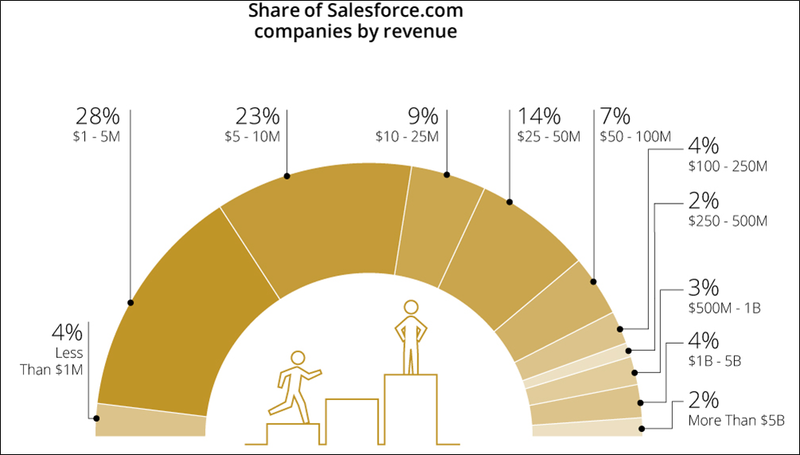 So, Why Are Small Businesses Falling Out of Love with Salesforce? *Salesforce didn’t reveal the number of customers in 2013 and 2014. Salesforce is focused on closing larger deals instead of large number of deals. Post-IPO, in order to sustain growth they have chosen go after large enterprise customers. It is impossible to build a product (or deliver a service) that is great for customers of all sizes. You Can’t Be Everything To Everyone. As a product grows, the number of features increase and workflows become more complex. Requirements of a large enterprise is very different than that of a small business. Abundance of features and the degree of customization simply become overwhelming for a small business user. It is not feasible (or desirable) for a small business to hire external consultants for setting up the CRM system and making subsequent changes in the future. Full of white space (unused screen) and you need to scroll down to the bottom to find out your CRM tasks. Modern SaaS solutions have delightful & intuitive UX. For example check TeamWave. This is what you see when you login to CRM. with Salesforce, a small business might choose the lowest pricing to start off, but as you dig deep into the software, you’ll realize that your CRM strategy has fallen prey to restrictive pricing. It means, at that pricing you can’t use some of the important features (example: API access) to integrate CRM with your company’s workflow. Removal of critical features from the base plan forces companies to move to higher plan and they end up playing 2x or 3x. There is a significant learning curve associated with Salesforce and SMEs need to spend time & money to get things rolling. Software Complexity is the biggest inhibitor of adoption in a small business, most sales people don’t enjoy using software that overwhelms them. Time & money are important resources for companies of all sizes … for SMEs they are CRITICAL. It’s very difficult for a company of the size of Salesforce (with more than 3M users) to provide timely & personalised solution to all the customer issues. That’s how prioritization comes into play. Because enterprise/large customers pay more, they get more attention and enjoy the privileges associated with a key account. The reports generated via Salesforce are highly customizable. The problem is, this makes reporting a time consuming and cumbersome process. Small businesses have to spend lot of their time or hire expensive consultants to implement custom reporting. Example: For something as simple as a chart for “closed deals by sales reps”, you need to go through several steps of choosing the reporting folder, specific report, customization and chart selection. Small businesses need a nimble and out-of-the-box reporting solution that’s capable of providing deep insights. What are the best “Salesforce alternatives” for small & medium sized companies? Make sure you try most of them before choosing a solution that can help your business succeed! The pushing of these tools as the feasible and reachable panacea small business are looking for is in effect is a disservice to small business and, I would venture to say, borders on the limit of truth in advertising, for wich some of these companies can be found guilty. Finally, I know of agencies that not only are trapped in paying yearly subscriptions for something they can’t use but are also paying a high price when they realize they are been forced to become publishing house and content developers, when in fact that is not in their normal line of business – and are not set up for it. So overall many small businesses, thinking these would be great tools to help them in their marketing effort, actually fall into this quagmire of yearly expensive subscriptions, unattainable technology and misdirected business effort. I would recommend that unless you have at least three additional people in your agency right now, doing nothing, don’t go for any of these tools, and save yourself some money trouble. Hey Preetish, How many of salesforce customers are small and medium business? Hi Preetish, thanks for sharing this well-researched article. The statistical data and graph representation was an eye-opener. 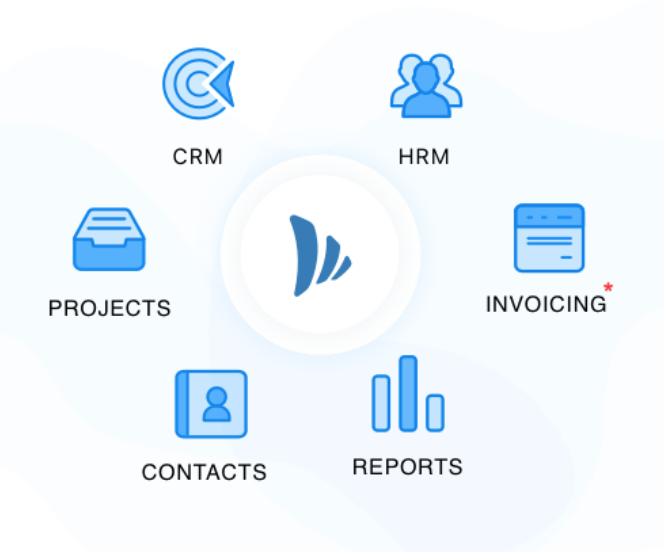 However, I would like to add that Salesforce.com is putting in a lot of effort to make the Salesforce CRM platform more user-friendly and affordable for all Small businesses. While I agree with much of what you said using the classic UI as an example and not the modern Lightning UI makes this article inaccurate.